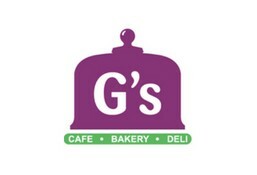 G's Bakery & Cafe is currently closed for delivery and it will open at 10:00 AM today . Moist and luxurious, bite into a velvety dream, topped with tantalizing cream cheese frosting. Our chocolate cupcake topped with light chocolate frosting is big in taste. Our chocolate cupcake with a of real chunks of kitkat is a bite of pure happiness. Classic red velvet with a dollop of nutella! Are your jaws dropping yet? The perfect accompaniment to your daily cuppa, our lotus cupcakes filled with pieces of real lotus biscuits go well with any of our coffees too! Our oreo cheesecake is a decadent cold cheesecake that will win you over with the first bite! Rich layers of mascarpone cheese, coffee and ladyfingers, this is an in-house favourite and a must try!! Chocolate walnut walnuts really make the difference in our brownies they are rich, chocolate and dotted with walnuts and drizzled with salted caramel sauce. Who doesn't Love nutella? Our dark chocolate cake with hazelnut and chocolate fillig will satisfy young and old!! An absolute treat red velvet sponge with creamy smooth nutella ganache each bite ss simply delightful of this beautiful looking "naked cake"